Bali Butterfly Park (Indonesian: Taman Kupu-kupu Bali) in Tabanan regency is the biggest butterfly garden in Bali and also in Indonesia and Southeast Asia for the preservation and breeding butterflies and insects. Bali Butterfly Park is a conservation area which provides a variety of specimens, here we can actually see the several hundreds of butterflies that live and breed in the park. Bali Butterfly Park in Tabanan Bali is aside as a conservation and education, as well as an attraction visited by many tourists, students, and researchers that become one the best attractions in Tabanan. Indonesia is a country that has the third largest forest, rich in biodiversity as well as second in the world which have a huge potential to be a natural charm. Indonesia is also known as the Kingdom of Butterfly because of the diversity of species of butterflies and many insects that live in forests of Indonesia are scattered in different areas with a wide variety of species with beautiful shapes and colors. The history of the Tabanan Bali Butterfly Park (Taman Kupu-kupu Bali) originated from the implementation of the International Conference of the Butterfly (International Butterfly Conference) in Ujung Pandang on 23rd - 27th August 1993 by the Ministry of Tourism of The Republic of Indonesia. The conference attended by butterfly experts from inside and outside the country to discuss the wealth of butterflies belonging to Indonesia as well as the efforts of the good management and utilization, as well as introducing a natural butterfly garden residing in Bantimurung South Sulawesi to tourism to be an example for the establishment of other butterfly parks. After the conference ended, some participants in the country including from PT Ikas Amboina gathered to discuss the essence of the meeting, which is about the preservation and utilization of the butterfly through tourism activities, how to create a replica of the butterfly garden naturally as in Bantimurung and how to conserve and utilize the butterfly in a sustainable manner. Three months after the organization of the conference in Makassar (Ujung Pandang), right on 28th November 1993, established PT Taman Kupu-kupu Lestari as an organizer and founder of the Bali Butterfly Park. Establishment of Bali Butterfly Park by PT Taman Kupu-kupu Lestari started after the approval of the central and local governments as well as from the local community. After almost three years of building, then on the 17th December 1996, Bali Butterfly Park opened officially as one of the attractions of nature and education and inaugurated by Ibu Asiawati Oka, Chairman of the PKK of Bali Province. This park has an area of ​​1 ha, consisting of 3,700 m² for the butterfly habitat and the remaining 6,300 m² is used for the flower garden as plants and herbs that are used as food and cultivate the butterfly and the rest is for tourist infrastructure. There are five types of cages are used during the process of breeding butterflies, e.g. reproduction cage, the cage for maintenance eggs, cage to nurture the larvae, pupae cage, and the cage of butterflies. 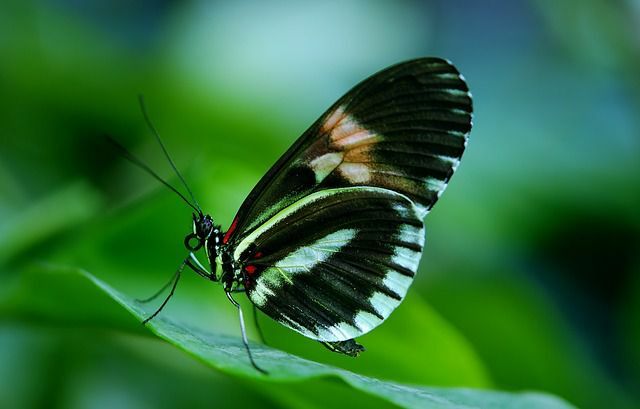 In addition to various kinds of butterflies are preserved in Bali Butterfly Park attractions, also include a wide variety of insects such as Cobalt Blue Tarantula, Scorpion, Celenocosmia javanensis. From the results of the study (2010) finds that there are 15 species/types of butterflies are bred at Bali Butterfly Park Bali Taman Kupu-kupu Tabanan, which consists of two families Papilionidae and Nymphalidae. Two types of families Papilionidae are protected butterflies, i.g. 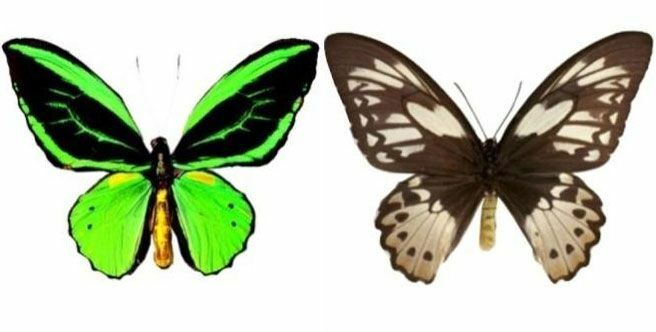 Ornithoptera priamus and Troides helena. Butterfly Ornithoptera priamus of the family Papilionidae have a wingspan of 70 mm, male butterflies have a green color, has a black color with shape nearly oval in the discal front wing which is surrounded by the green color on the front and back, have a pattern of black color along the edge of the wing. Rear wing has a green color with a black edge of the wing. The female butterfly is black with a white stripe on the front wing and white color pattern on the rear wing. In each of the rear wing, there are four black dots. Butterfly Troides helena has a wingspan of 70 mm, the front wing has a dark blackish brown color, have a smooth yellow scales arranged in a line. In the male butterflies, apical portion of the wing has a black color and on the tornus have separate black dots. Rear wing has a golden yellow color with black veins. In the female butterfly, on the upper part of the wing tornus has a black color, has a point of marching in the submarginal. Tourist attractions Bali Butterfly Park Tabanan is one of the largest butterfly gardens that make this place visited by many tourists and students. The places of interest Bali Butterfly Park Taman Kupu-kupu Tabanan has also been supported by adequate tourism facilities with butterfly museum special exhibit a collection of various types of butterflies, and also accompanied by a gallery of various handicrafts/souvenirs made ​​of various insects such as: Framing Butterfly (butterfly frame), Framing Beetle (Beetle frame), key chain made from insects, bookmarks made from butterfly, paper weight made ​​of fiber nodes containing butterflies, painting of butterfly wings, etc. For visitors of the Balinese themselves many of them came to visit Bali Butterfly Park on holiday with the family, and generally they also want to look directly The Kupu-kupu Barong or Kupu-kupu Gajah (Attacus atlas), in English is called Atlas moth that now its existence is endangered and hard to find on the island of Bali. Usually tourists will visit the attractions Bali Butterfly Park after they visited the Subak Museum or before visiting the attraction Jatiluwih rice terraces or Batukaru Temple Bali, because to get to the location is same way by road to a tourist attraction Jatiluwih, Penatahan hot water springs, and Pura Luhur Batukaru Temple, For those of you who have never visited Bali Butterfly Park, come to visit Bali Butterfly Park and enjoy your holiday with family or those closest to you! See The Mystery of Nature! The location Bali Butterfly Park (Taman Kupu-kupu) is located in Jalan Batukaru, Br.Sandan Lebah, Sesandan village, Wanasari, Tabanan subdistrict, Tabanan Regency - Bali Indonesia. Distance from the city of Denpasar is around 28.4 km or approximately 1-hour drive.